The M12 Rivet Tool is the first cordless solution that delivers fast, easy riveting while maintaining performance, durability, and size. 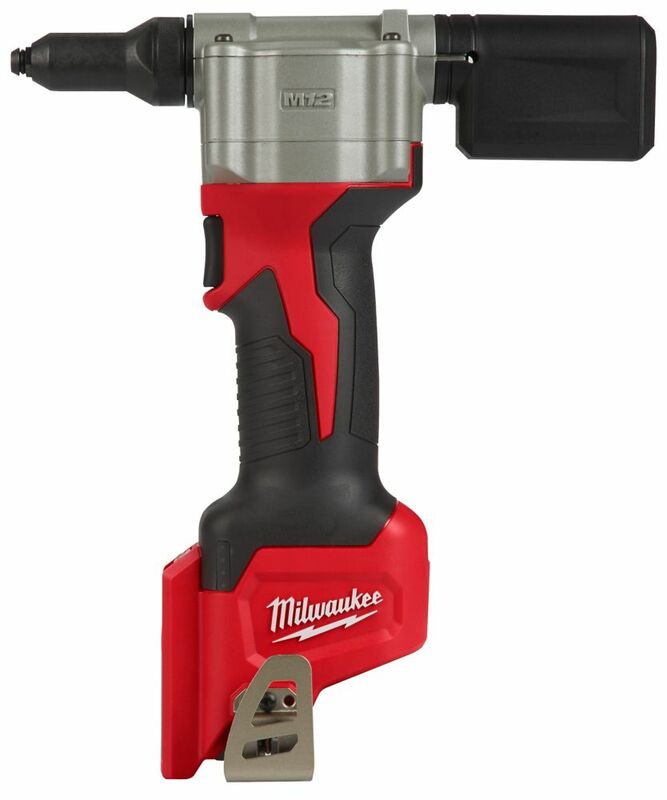 The 2550-20 can pull up to 3/16-Inch stainless steel rivets, 450 1/8" steel rivets on one 1.5 a/hr. charge, and reduces muscle effort from a hand tool by over 60%. No compressors or hoses during set up and operation makes this tool a great replacement to pneumatic products. 2X longer life over current cordless solutions delivers greater durability from common jobsite conditions and use. This is the most compact cordless rivet tool on the market, measuring only 6.5" in length allowing users more access in tight spaces. The M12 Rivet Tool is part of the M12 battery platform, offering 90+ solutions on one battery system. The Bosch PLH181 planer is great for fast stock removal and leaves a smooth finish. This planer is ideal for trimming doors, and because it is cordless, it eliminates the possibility of running out of cord in the middle of a planing pass. The electronically counterbalanced single-blade system automatically positions the blade at the ideal cutting angle, and it eliminates uneven planing caused by misaligned blades. The planer comes with a guide fence that can be mounted to either side of the tool. The Bosch line of cordless tools uses the industry's most advanced Lithium-Ion technology for greater battery life and more run time, all in a lighter package. Battery and charger sold separately. The DCK491L2 20V MAX Lithium Ion 4-Tool Combo Kit includes a hammerdrill with a 3-speed transmission, reciprocating saw with keyless blade clamp, circular saw with 6-1/2inch carbide blade, and a 20V MAX LED work light. Innovation For The Trades. The 20V MAX* Cordless ACSR Cable Cutting Tool cuts cable without distorting it for easier connector installation to help utility electricians increase productivity. The guillotine style blade slices cleanly through 1590 ACSR, 750 MCM Cu, or 1000 MCM Al. The blade is easily replaceable in the field to maximize uptime. The DEWALT DCS355B Cordless Oscillating Multi-Tool is designed with Brushless Motor that delivers up to 57% more run time over brushed. This tool features the DEWALT QUICK-CHANGE Accessory System that allows blades and attachments to be changed quickly without wrenches. This tool is backed by a DEWALT 3 Year Limited Warranty for added peace of mind. M12 12V Lithium-Ion Cordless Rivet Tool (Tool-Only) The M12 Rivet Tool is the first cordless solution that delivers fast, easy riveting while maintaining performance, durability, and size. The 2550-20 can pull up to 3/16-Inch stainless steel rivets, 450 1/8" steel rivets on one 1.5 a/hr. charge, and reduces muscle effort from a hand tool by over 60%. No compressors or hoses during set up and operation makes this tool a great replacement to pneumatic products. 2X longer life over current cordless solutions delivers greater durability from common jobsite conditions and use. This is the most compact cordless rivet tool on the market, measuring only 6.5" in length allowing users more access in tight spaces. The M12 Rivet Tool is part of the M12 battery platform, offering 90+ solutions on one battery system. M12 12V Lithium-Ion Cordless Rivet Tool (Tool-Only) is rated 4.5 out of 5 by 76. Rated 5 out of 5 by rocket from works as advertised, being potable to use anywhere is great !!! works as advertised, being potable to use anywhere is great !!! Rated 5 out of 5 by LCG from Bought this tool for specific job. We have used about... Bought this tool for specific job. We have used about 400 rivets so far and have had no issues. Tool didn’t come with a battery but I was surprised how long the battery charge lasted. Rated 3 out of 5 by Handy from Quite heavy for such a small tool but seems to... Quite heavy for such a small tool but seems to work well and much faster than the old school poppers. Rated 5 out of 5 by Rich from Excellent tool. Works great. ... Excellent tool. Works great.